Another ad teasing Tingle's return to the Nintendo DS appears in this week's issue of Famitsu, according to various sources (including IGN.com). This teaser provides even less information than the one that appeared in last week's issue of the popular Japanese gaming mag. 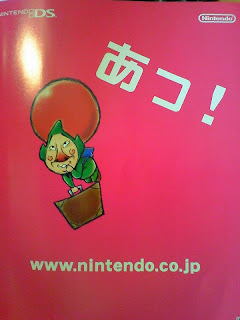 That ad featured a tiny image of Tingle being carried by a balloon and text that read "fairy?" This week's ad features a larger image of the character along with text that reads "ah!" Expect more information on the as-yet-unnamed title tomorrow, as a note on Nintendo's teaser site (click on the television in the lower-left-hand corner of the screen) suggests that's when a trailer of some sort will be released.